ConAgra Foods, the company that brings ingredients like Hunt's, Libby's and Wesson to my pantry, now has a new ingredient, but this one is for my blog! Their site, The Dish, offers easy access to recipes, cooking advice, kitchen tips, and other exclusive content from ConAgra Foods. The site has a Seasonal Spotlight section that will give you the latest news from ConAgra Foods, as well as great recipes and tips for cooking for the season! If you want more, the Recipe Resource section is full of ideas for you to try and share. I love the features for holiday recipes, and not just the big holidays like Thanksgiving, but every holiday, even St. Patrick's Day! There is also a great article called "What To Cook?" that gives you ideas for recipes that would be great to feature on your blog each month. So when you have your calendar out trying to plan out your blog content, you can gain inspiration and ideas from the fabulous staff of The Dish. All of this great content is put together by a team of Mom's, bloggers, ConAgra Foods experts, and celebrity chefs. You can check out each of them and even ask them questions directly in the Ask Our Team section of The Dish. You may even see a familiar face or two in the section. Courtney Dial Whitmore is one of my favorite bloggers. She is the creative lady behind Pizzazzerie and the author of Push Up Pops. George Duran is the host of The Ultimate Cake Off on TLC and author of Take This Dish and Twist It. Phil Lempert is a food marketing expert that appears as a correspondent on The Today Show and is on The View monthly. The Dish is great, but my favorite section is First Look First Taste. Not only are bloggers given a sneak peak of products and promotions that will be hitting the store shelves soon, but you can request a sample of the product to try before it even hits the shelves. 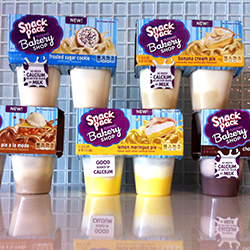 My kids will be toting the new Snack Pack Bakery Shop collection in their lunch boxes before anyone else and my readers will be able to read about our experience with them before heading to the store to grab some of their own. The site is so easy to join. Head over to The Dish and check out all of the content they have to offer. Make sure to register with your name, email address, and blog address so you can gain access to the First Look First Taste section. After you have checked out The Dish, come back and let me know what section you enjoyed. Leave a comment and you will be entered to win a $50 gift card to help stock your pantry! Rules: No duplicate comments. You may receive (2) total entries by selecting from the following entry methods: a) Leave a comment in response to the sweepstakes prompt on this post b) Tweet about this promotion with hash tag #sweepstakes and leave the URL to that tweet in a comment on this post c) Blog about this promotion and leave the URL to that post in a comment on this post d) For those with no Twitter or blog, read the official rules to learn about an alternate form of entry. This giveaway is open to US Residents age 18 or older. Winners will be selected via random draw, and will be notified by e-mail. You have 72 hours to get back to me, otherwise a new winner will be selected. The Official Rules are available here. This sweepstakes runs from 8/22/2012-9/8/2012. Be sure to visit Con Agra Foods' brand page on BlogHer.com where you can read other bloggers' reviews and find more chances to win! The recipe resources section is the most useful. I enjoyed the Recipe Resources Section. Recipe Resources section is the most useful to me. i like the recipe resources. I like the Seasonal Spotlight because I'm always trying to eat seasonally. I think the Seasonal Spotlight section on The Dish is the most useful & best. i like the Seasonal Spotlight section. I really liked the Seasonal Spotlight section. I love the holidays and the seasons and am always up for learning new things and trying new things to make them all more enjoyable! I like the Recipe Resources section. I like the product samples from the First Look, First Taste section! I like the recipe resource section. If I had a blog I'd use the First Look First Taste section! I find the Recipe Resources section of The Dish to be the best or most useful of all.